He was prepared for a snub. Or, at least a round of intense deliberation. Instead, Yashish Dahiya walked out of the meeting triumphant, without breaking a sweat. Sanjeev Bikhchandani, an investor in his fledgling startup Policybazaar, not only gave him a patient hearing and acknowledged his concern, but also promised corrective action, all within a few minutes. The bone of contention was a clause on liquidity preference that was skewed heavily in favour of Bikhchandani’s firm Info Edge, the only institutional investor in Policybazaar, with a 49 percent stake. In 2010, when venture capital (VC) was still a novelty in India and investors had the luxury of dictating terms, Dahiya could have done little had Bikhchandani not relented. Deep Kalra, founder and group CEO at MakeMyTrip, says “Sanjeev has an amazing sense of corporate governance and ethics.” Kalra, like Dahiya, has seen Bikhchandani play by the book from close quarters when he was on MakeMyTrip’s board until the firm listed on Nasdaq in 2010. “We used to pay the board members a fee. Sanjeev agreed to take MakeMytrip stock, but insisted that the stocks be allotted to Info Edge and not him personally. The logic was he was taking time away from his company to give us, hence, the company should benefit and not him,” says Kalra. Today, Bikhchandani is reaping a rich harvest of the blood and sweat that has gone into building Info Edge, which runs job portal Naukri, 99acres in real estate, Jeevansathi in matrimony and Siksha in education. With the firm’s stupendous success in the last two and a half decades, Bikhchandani has achieved a few distinctions that every consumer internet entrepreneur would wish to emulate: He owns about 34 percent of a consumer internet unicorn that has been churning profits for about a decade and trades on the Indian bourses. For good measure, he has debuted on the World’s Billionaires list of Forbes with a net worth of $1 billion. Success hasn’t come easy for Bikhchandani. Naukri, the firm’s first offering, not only survived the global financial meltdown in 2000 with a paltry ₹7 crore from ICICI Ventures, but also fought a fierce battle with local incumbent JobsAhead, global rivals such as Monster (which eventually bought JobsAhead), Jobstreet and Stepstone, and won. More recently, it has managed to keep the likes of LinkedIn, Shine or Timesjobs in abeyance. “It is one of those businesses that has figured out what the moat is. Credit to them because in the internet space, normally people aren’t able to sustain the moat for so long,” says Ashish Dhawan, founder and chairman at Central Square Foundation. Also the founder of private equity firm Chrys Capital, Dhawan had invested in JobsAhead. Info Edge’s success stems from Bikhchandani and his team’s ability to stick to a few quirky decisions that defied the basic tenets of internet business. Take for example Naukri’s massive fleet of inexpensive field sales executives when remote sales was the norm at internet startups. The logic was simple. When in India, behave like an Indian. The leadership was convinced that in India, nothing beats an in-person sales pitch. “You need to focus on customers and make sure that you are solving their problems. If you are, then cost of customer acquisition goes down, defensibility goes up, capital requirement goes down. If you don’t, you need lots and lots of capital to stay in the same place,” Bikhchandani told Forbes India in an earlier interview. Bikhchandani’s conviction in his methods is infectious. Kalra will testify. At a time in the mid-2000s, MakeMyTrip had built a sizeable ticketing business, but struggled to grow the holidays vertical. “You’ve got to open up offline stores and only then people will start trusting you to buy more than an air ticket,” was Bikhchandani’s advice. All said, Info Edge is still a work in progress. The company is heavily reliant on Naukri, which accounts for about 73 percent of the company’s overall sales. “It [jobs] is a nice space, but not very large. The downside is, after 20 years, you have a $100 million revenue business. The upside is, obviously, very high Ebidta margins [56 percent in FY18]. But, it is not a huge pool,” says Dhawan. The other verticals haven’t fired as expected, but the Info Edge stock has appreciated 33 percent in the last one year. Bikhchandani has not only mastered the art of accumulating, but also letting go. In 2010, he relinquished the firm’s day-to-day operations to Hitesh Oberoi to focus on strategic investments. “Post IPO (in 2006), there was significant work to be done and it needed to be done well. It was a happy coincidence that there was a requirement and a person was ready for it,” said Bikhchandani. Bikhchandani is an instinctive investor who comes with his share of biases and prejudices, but is mostly the last one to jump off a leaking boat. Policybazaar, now a unicorn that counts SoftBank as an investor, is a case in point. Dahiya recalls a time around 2010 when the company was on a downward spiral, saddled with regulatory challenges. The insurance regulator had banned them from making money through advertisements and lead generation. The company needed more money as it started morphing into a sales business. Bikhchandani, who had already pumped $4 million into the firm, was reluctant to invest more, apprehending regulatory hurdles. But he did invest, albeit just enough to convince new investors that the business possibly had merit. “It was a risky proposition. He [Bikhchandani] had no interest in taking that risk. But he supported us for those two to three years, even though he did not like the business,” says Dahiya. Between 2008 and 2015, Info Edge’s holding in the company had slumped from 49 percent to 9 percent. Interestingly, Info Edge started investing in Policybazaar from 2015 onwards, raising its stake to about 16 percent since. “He can change his opinions and he is very decisive once his opinions change. At that seniority, people are opinionated. 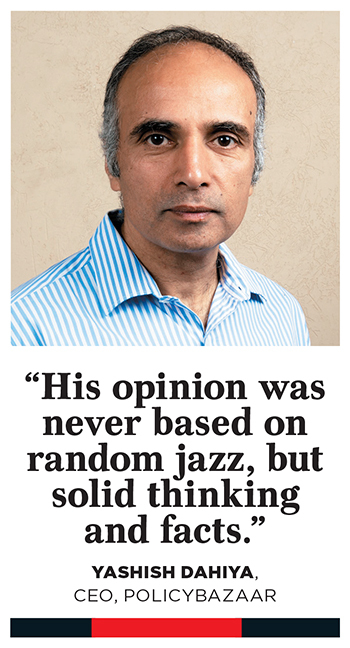 But, his opinion was never based on random jazz, but solid thinking and facts. It was his interpretation of facts, of course. And, when something changed that challenged the interpretation, he was willing to change his entire thinking,” adds Dahiya. Bikhchandani is credited with discovering pearls like Policybazaar and Zomato. Info Edge’s cumulative investment of ₹64 crore in Policybazaar is worth ₹511 crore, while the approximately 34 percent stake in Zomato until November 2018 was worth ₹4,792 crore, according to Tracxn. But the buck stops there. Info Edge, which sat on reserves and surpluses to the tune of ₹1,986 crore in FY18, has been unable to unearth more gems. In 2018, the firm wrote off ₹53 crore in startup investments and provisioned for another ₹133 crore. That is how Bikhchandani is: Go all out for a cause where he sees merit. More recently, it has been philanthropy. 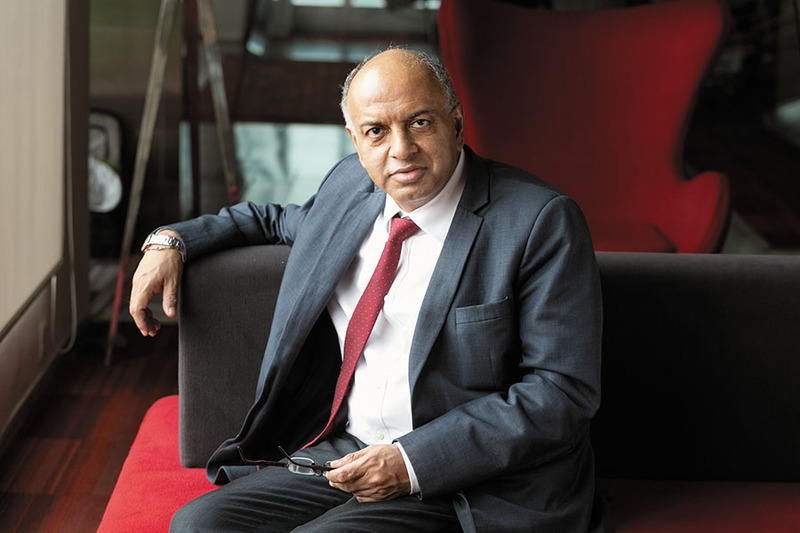 Bikhchandani, along with Dhawan, has been at the forefront of setting up Ashoka University, a not-for-profit educational institute in Haryana, focused on liberal arts. Bikhchandani, say people in the know, has committed about ₹150 crore of his personal wealth to the institute. The number certainly pales before the hundreds of millions the likes of Wipro’s Azim Premji or Infosys’ Nandan Nilekani have pledged to philanthropy, but, it is a start, after all. Bikhchandani jumped into promoting liberal arts with the same zeal and fervour as he does with every startup, says Dhawan. And, as is the case with businesses where he has a stake, Bikhchandani has his share of beliefs and doesn’t mince words to put a point across, even if it is an unpopular opinion. Dhawan recalls a time when Ashoka University almost became a multi-disciplinary institute, until Bikhchandani stepped in. “There were some people who were very passionate about doing engineering. But, he [Bikhchandani] just put his foot down saying we were either doing a liberal arts university or we were not doing it. Had we gone down the other path, liberal arts would have been the orphaned child. Having a little bit of that cowboyish nature is a good thing because someone needs to bell the cat and call a spade a spade,” says Dhawan. Bikhchandani declined to comment for the story. At times he prefers being the humble backstage operator. “With Ashoka, he insisted that nothing be named after him—a building or a programme. These are simple things, but, such things define him,” says Dhawan.